The 4 star superior Dolmen Resort Hotel set on the Qawra seafront is another well established hotel within the hospitality division of the Group. It owes its name to the Neolithic megaliths which stand in its grounds. 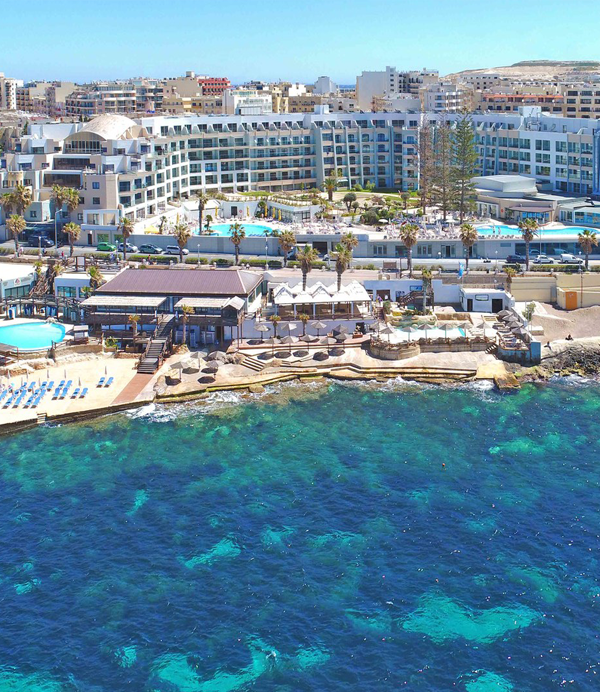 Extensively refurbished in 2017, the 4 star hotel is beautifully located at the water’s edge and boasts 408 guest rooms and 38 highly finished superior rooms and suites with panoramic views of the Mediterranean Sea and St. Paul’s Islands. All bedrooms and suites are fully air-conditioned / centrally heated and have their own private bathroom, Wi-fi Internet (Free), safe deposit box (charge), satellite TV, direct dial telephone, radio, mini-bar and hair dryers. The majority of the rooms have a balcony or terrace. The hotel’s general facilities include a Conference Centre, Casino, an A La Carte Restaurant, Buffet Restaurant, Lobby Lounge Bar, Cafeteria, Swim-Up Bar and a Caribbean Style Beach Club offering a variety of water-sports, a Diving Centre, Bars and Restaurant. Four outdoor swimming pools are located within the hotel together with one dedicated for children. The newly designed Spa incorporates state of the art Therapy rooms with the latest equipment as well as a Fitness Room, Indoor Pool with hydro massage and sauna. Wi-fi Internet is available free of charge in all public areas. Animation Activities are provided on a daily basis together with a kids club during the summer months. A regular entertainment programme is held during the evenings.